If your child has a food allergy or another serious allergy, then stick these Allergy Warning labels on all of their cups, food containers, bag tags and travel gear to help remind other caretakers. There’s plenty of room to list up to six allergies on three lines of text. Comes in assorted bright colors for maximum visibility. the labels work great! very satisfied. I am extremely happy with these new labels. They have a rubbery/more plastic feel to them, verse the first set of labels I got. 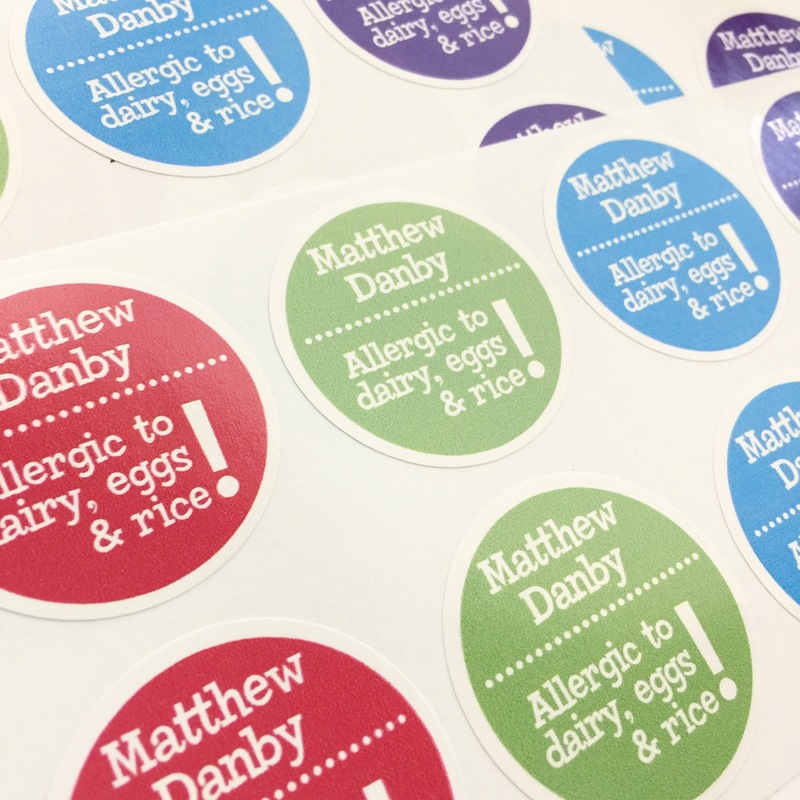 I purchased these labels because my 10 month old was starting at a new daycare, and he is extremely allergic to all dairy. It scared me, I actually lost sleep over it, that they would accidentally give him milk or cheese. With these labels I have no fear, I put them an all of his bottles and sippy cups. The daycare is very thankful too, they like the extra reminder. Fun labels that are eye catching that makes it safer for my son. And the kids love putting them on and showing them off to people. I got these in the mail yesterday and I went ahead and stuck them on every one of my daughter's "to go" things to reminds the people that are taking care of her she is Gluten Free! It is such a great idea to remind people through a sticker. EVERYONE already noticed them so it's not like they aren't working. I have complete faith that she will have less "allergy accidents" from these stickers! I have a 3 year old allergic to peanuts, dairy and eggs. As his world starts to widen, I need to know that he is as safe as possible. 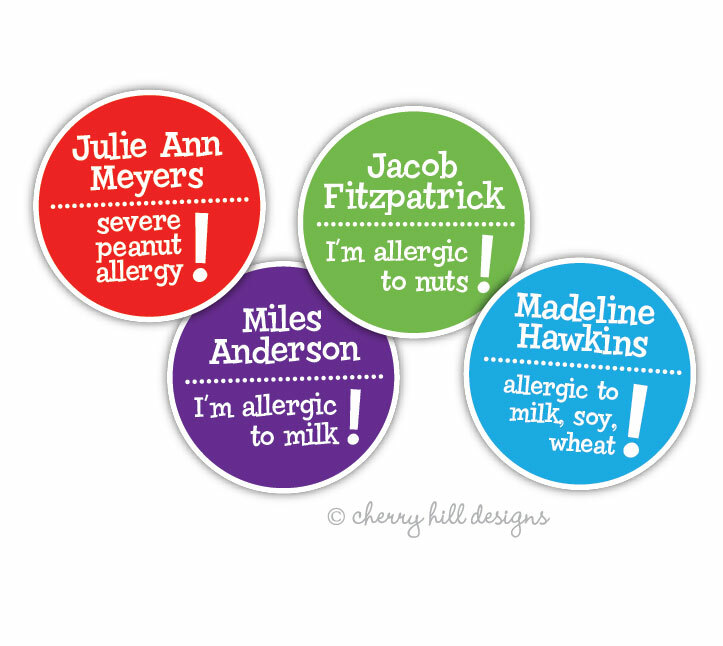 These labels are a great way to let well meaning people of his allergies without having to have a whole conversation about it. Thanks! Perfect labels of great quality! These are perfect for my 6 month olds bottles! Her name and the allergy is loud and clear while also being classy and cute! Great quality that has survived many washes in the dishwasher and soaks in the hot soapy water! they look great and serve the purpose so stylishly! thanks for a great product!